NOTE: This guest post was written by Roxane Heidrich and Morgan McMichen. Roxane and Morgan are graduate students at the Seton Hall School of Diplomacy and International Relations. Roxane’s specializations are Global Negotiations and Conflict Management and International Security, Her interests are international mediation and cross-cultural dialogue. Morgan’s specializations are in International Organizations and Global Negotiations and Conflict Management. Her interests are the function of international institutions in a global society and negotiation as a means of deterring conflict among multinational actors. 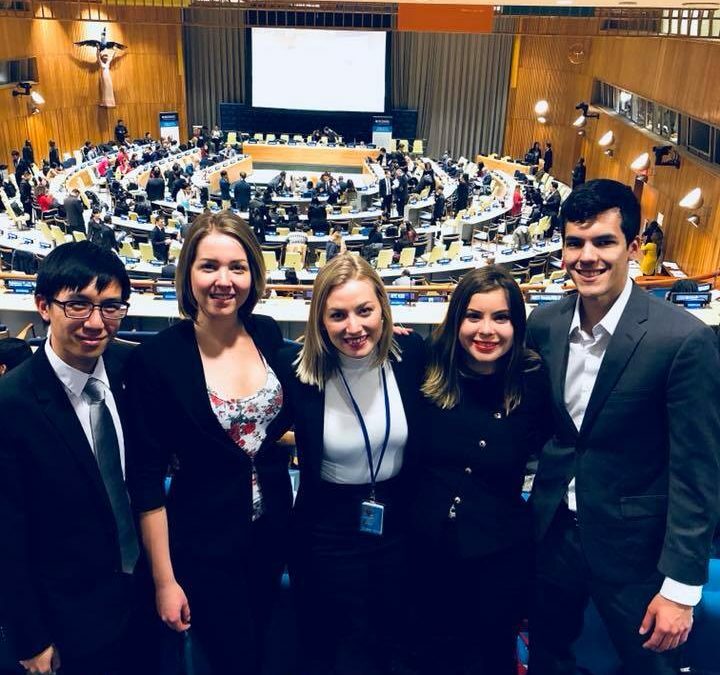 Special thanks to Alexander Miller, Seton Hall School of Diplomacy and International Relations graduate student and winner of the Seton Hall SDG Challenge Scholarship for his contributions to this blog. On January 30th-31st, the seventh edition of the Economic and Social Council (ECOSOC) Youth Forum took place at the United Nations headquarters in New York. At this two-day event, Member States, NGOs, Youth Ministers, Youth Representatives and young leaders from around the world convened in the Trusteeship Council with spillover in the ECOSOC chamber. The theme was “The Role of Youth in Building Sustainable and Resilient Urban and Rural Communities”. In its capacity of institutional member of the Academic Council on the United Nations System, the School of Diplomacy participated in the forum with its delegation of both undergraduate and graduate students. Key to the success of this initiative was its clear focus on youth as critical actors in the implementation of the 2030 Agenda for Sustainable Development. With a view to the high-level political forum to be held in July 2018 on “Transformation Towards Sustainable and Resilient Societies”, the purpose of this conference was to bring together the voices of young people with those of policymakers and political actors. The explicit goal was to encourage the transition from issues to solutions. In his opening remarks, H.E. Mr. Miroslav Lajčák, President of the 72nd Session of the United Nations General Assembly, stressed the central role of youth and the urgency of taking action: “If we neglect young people, we will not achieve a single SDG”. Young people are not the future, he said. “They are the now”. The event was structured around the interactive roundtables, breakout sessions, and plenary sessions that were held in the following two days. Eminent attendants to the conference included Ms. Salina Abraham, President of the International Forestry Students’ Association, Ms. Jayathma Wickramanayake, United Nations Secretary-General’s Envoy on Youth, and many more Ministers, high-level speakers, and youth organization representatives. As for the issues being discussed, the focus was defined in terms of both regional developments and developments in single Goals on the 2030 Agenda. The breakout sessions held on both days were particularly interesting. They were designed to engage civil society groups who had experience to share in a specific field with political actors ready to hear about the latest achievements and ongoing obstacles to the implementation of the SDGs from a youth perspective. Day one featured breakout sessions on water sanitation, energy, urbanization, environment, and technology, therefore touching upon at least six Sustainable Development Goals. Relevant outcomes emphasized the vulnerability of rural and indigenous communities, the impact of poverty and discrimination, and the need to raise youth’s awareness on consumption patterns. Despite the setbacks pointed out, success stories were shared too. Goal 15, for instance, is one of the issue areas of global development in which youth organizations, governments, and NGOs from around the world are consistently joining efforts. Protecting terrestrial ecosystems, managing forest resources, and combating desertification – all purposes under the Goal 15 umbrella – are successfully promoted by creative and sustainable initiatives. In Brazil, youth are involved in government-sponsored projects for the safeguard of indigenous life; similarly, Serbia and Russia support their young people financially while they participate in reforestation initiatives domestically and abroad. After the breakout sessions ended, all attendees reconvened to hear each report of the outcome of each session with an interactive discussion to follow. Day two began with regional breakout sessions aimed at tackling the deterrents of urban and youth involvement. In Latin America, for instance, there was a concern that SDG awareness must be taught from elementary age in order to raise generations who will carry out the SDGs. Some youth leaders pointed out that in poor communities, families do not have the means to send their children to school to learn about things like protecting the environment or ensuring water sanitation. Furthermore, sometimes even if school is free, children are needed to work and help support the family. However, one youth representative brought up the fact that many of the goals are already being realized in several ways. Therefore, instead of explaining the SDGs to increase realization, the concept should be turned around so that what is already being practiced can be encouraged, celebrated, and shared with others. After the breakout session report there was an interactive round table focused on Means of Implementation & Financing Youth Development, featuring Ministers, other High-Level speakers, and youth organization representatives. The round table was followed by the stakeholders’ pledges of commitment to building resilient and sustainable communities. Here we heard from several stakeholders including government representatives, international organizations and NGO’s. There were several positive pledges on many fronts. UN Habitat committed to establishing a network of global youth councils to interact, exchange ideas, and enable implementation. Mexico pledged to organize with others an international conference carried out by youth. Proceeding the conference, they will publish an article outlining international best practices. This year’s ECOSOC Youth Forum was both comprehensive and action-oriented. The participants not only pointed out the problems but also worked together to formulate policy recommendations and solutions. As a brainstorming prerequisite for the July Forum with policymakers, this year’s Youth Forum was complete with inspiring youth doing wonderful deeds in their communities and inspired youth who harvested the enthusiasm to carry out the SDGs in their own unique way.